Netflix's content curation efforts does result in some odd movies showing up in the library. I've noticed an uptick of interesting award-winning features from a while back now being available for viewing. And so I find myself finally getting around to movies that I've been intending to see but have not made much effort into seeing for one reason or another. 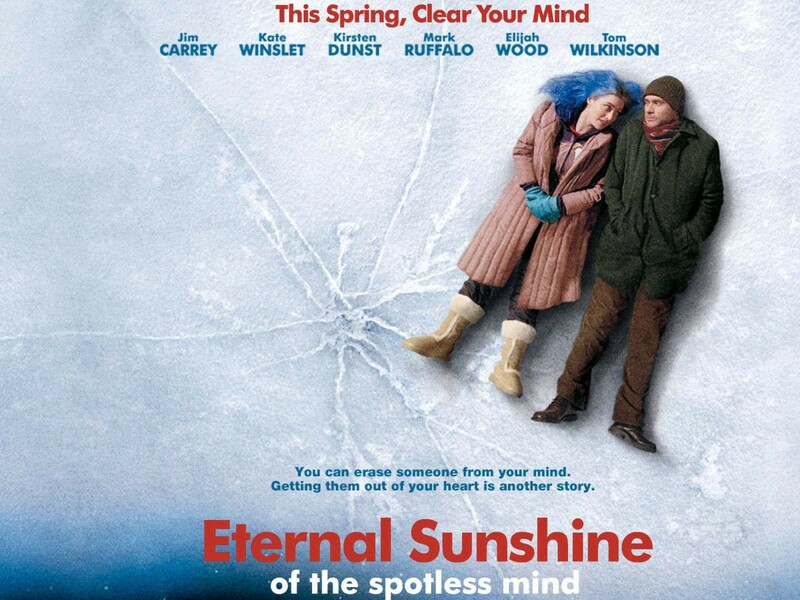 Enter Eternal Sunshine of the Spotless Mind, a movie that has a lot of good reviews but one that I've never really been all that eager to queue up for watching because I have very mixed feelings about the works of Jim Carrey. He's not a bad actor but he does end up in very odd projects (mainly his earlier comedic work) so that has dissuaded me from jumping at the bit to see any movie featuring him. But this turned out to be a more interesting effort even if it wasn't quite something I'd say that I totally loved or overly enjoyed. But I am happy to have finally seen it. Synopsis: Eternal Sunshine of the Spotless Mind is an American science fiction romantic comedy movie directed by Michel Gondry with a screenplay by Charlie Kaufman. It won a few awards including the Academy Award for Best Original Screenplay. The movie begins with the rather sheepish Joel Barish (Jim Carrey) meeting the more free-spirited Clementine Kruczynski (Kate Winslet) on a train to Rockville Centre. But as is the main premise of the movie, it turns out that they were former loves who had erased their memories of one another via a company called Lacuna Inc. Thus the bulk of the narrative shifts to Joel's perspective as he undergoes the procedure mainly in response to the fact that he hears that Clementine has initiated the procedure first. And thus in a series of non-linear flashbacks we see different aspects of their relationship together and see things getting wiped away forever. But given Joel's side in all this, he eventually resists the procedure after initiating it as he tries to preserve some idealized memory of Clementine despite the erasure. What I Liked: Gondry working with a script about mental landscapes is a naturally great combination and this movie has a lot of crazily creative interpretations of memories and how the brain works in a way that supports the story really well. We're not talking about Inception levels of optical illusions made real but instead a different yet consistent visual treatment that helps the story and makes sure we're all clear as to what is going on. I wasn't expecting Jim Carey and Kate Winslet to have on-screen chemistry but things actually worked in this movie. Like I could get how their two characters could end up together despite how different they are from one another and all that fun stuff. And that certainly lends credit to their acting abilities and how things had been directed to allow for such meaningful on-screen interactions. What Could Have Been Better: All that said, I'm not sure if I was fully on-board with the side-plots involving the members of Lacuna Inc who are performing the procedure. For some reason we had them also having stories that interacted with that of Joel and Clementine. This part of the movie wasn't bad in itself, but it did feel rather extraneous and we could have gotten by without it in order to focus more on Joel and Clementine or something. And then the ending felt a little cliche or too much like a traditional romantic comedy I guess. Again this just felt sad considering how the rest of the movie presented itself as such a daring concept to implement in an effort to tell this story. I wish the results had made more sense or had maybe had more of a twist or something. Thus the finale felt somewhat underwhelming. TL;DR: Eternal Sunshine of the Spotless Mind was definitely an interesting movie with some highly memorable visual moments. But it also felt somehow lacking in terms of that special something that would have pushed the overall concept to a whole separate level than what we ended up with. And so the movie just gets 3.5 ways Joel tries to save his memory of Clementine out of a possible 5.